Sometimes it's quite hard to find some decent basic items. And when you find the perfect basics, it takes a while to convince yourself in buying them (at least for me it works like that). Often those really perfect basics are a bit more expensive than you would expect so it's easier to spend your money on a more outstanding piece than just something plain. But in the end those basic items are the ones you grow attached to because you can always count on those to complete your look. So I made a wishlist of basic items that I would love to add to my wardrobe. 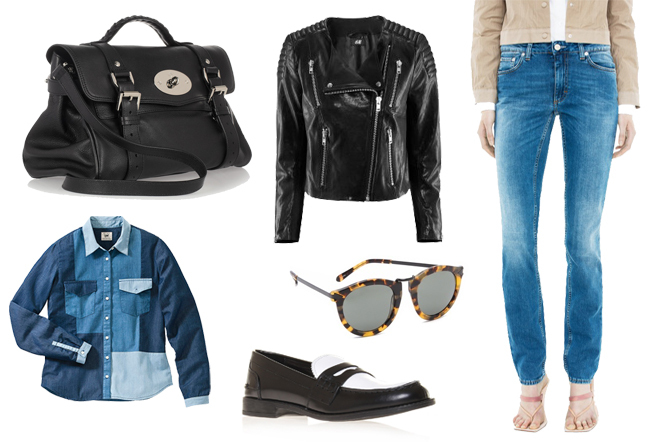 A pair of Acne mid rise slim fitted jeans in a light color, H&M black leather jacket with padded details, a Lee patchwork denim shirt, Mulberry Alexa satchel, two-toned KG London loafers and Karen Walker tortoiseshell sunnies. What basic items are you craving for? Oh, die tas en die jas! Prachtig! Ik ben zelf al een tijdje op zoek naar een mooi, zwart leren jasje. WAT een fijne items zeg! Ik wil zelf al heel lang het perfecte spijker giletje en t jumpsuit van de Zara (zie blog).